College life can be stressful. Stress appears in a variety of ways from challenging coursework to managing roommate relationships. What is stressful to one person is not always stressful to another. Recognizing what stresses you out is the first step to managing stress in a positive and productive way. Stress and anxiety are different. Stress is a response to a threat in a situation. Anxiety is a reaction to the stress. External triggers, like getting a bad grade or a disagreement with a friend. Internal triggers, like placing high expectations on yourself or fear of public speaking. It can be that extra pressure to complete an assignment by the deadline. But excessive stress can be bad for your emotional and physical health. When stress becomes too much, it can limit your ability to function at your best. 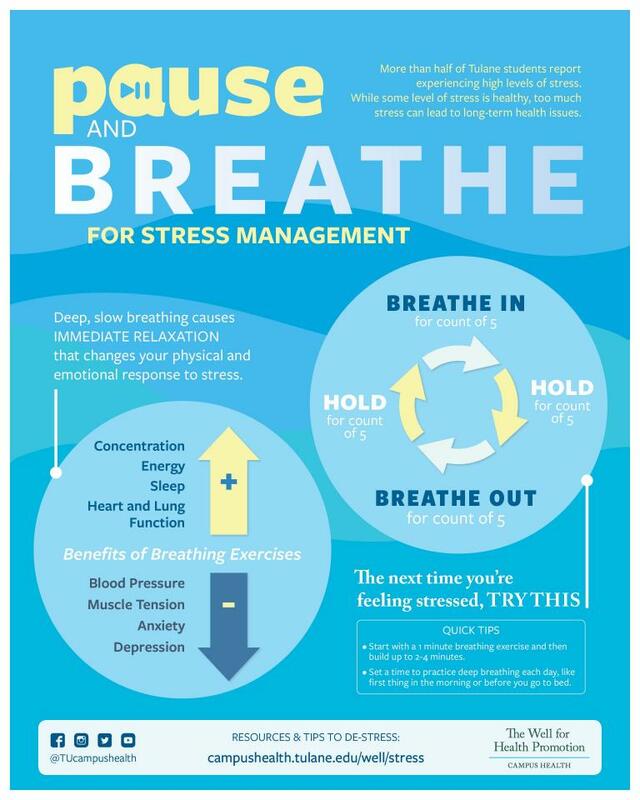 Breathing in more oxygen helps reduce your heart rate and relax your body. Try listening to a guided meditation for different breathing techniques. These can make you more tense or nervous. Drink flavored water or non-caffeinated tea. Is it school, work, family, social life? When these feelings come up, write it down log it on your phone. Look for patterns. Knowing what stresses us the most is the best way to identify solutions. Any form of exercise, from walking to yoga, can help boost your mood. Don't let lack of ZZZs get you down. Prioritize sleep daily. Nobody is perfect. We place high expectations on ourselves. Every day think about something you like about yourself or what you do really well. Whether it’s talking to a trusted friend, reaching out to a family member, or seeing a counselor/therapist, accepting that you may need help is a step towards improving your mental well-being.